I just celebrated – as every year – my Birthday: on Feb. 23rd. Like many others here whose Anniversary is also during this period (or that of August 15th, Sri Aurobindo’s Birthday….! ), I feel honored by this sort of date-wise connection, but whatever the date, we all give its due importance to our Anniversary, because of the fact that on that day, every human being is particularly open inwardly, open to the beneficial influence of his or her soul, and so also of this ONE divine reality that he or she is a part of, and the partial expression of, within that divine Oneness in which everything, whether consciously or not, is actually bathed as in a limitless, invisible Ocean. This year 2018, this Special Week has been all the more special because it was Auroville’s Fiftieth Birthday, its Golden Jubilee, as they say (please see my previous post, https://labofevolution.wordpress.com/2018/03/04/le-golden-jubilee-dauroville-comme-vecu-par-une-aurovilienne/ ). Since May 1975 and the full coming in front of my Psychic Being (in hardly a few steps after my arrival in Auroville in 1972), it so happened that as a direct consequence I got the inspiration for many songs of Love for the Divine, at first rather solemn or intimistic in style, then more and more on that creole kind of rhythm that my body, born of parents both from Martinique (in the French West Indies), spontaneously loves with all its cells. Well, since a few months – starting in September 2017 – I have received in a very unexpected and very powerful way, one after the other, several of those swinging AUROSPIRITUALS’, but this time all dedicated specifically to Africa! This immediately connected me again to that vast land of Africa where indeed I had chosen, in this lifetime, to be born, in Algiers, in a then French North Africa, and after that to go on growing, but in that Western Africa also French at that time, where my parents had gone back for their normal work in the then French Administration: in Sénégal, initially the countryside, then the capital Dakar, later on the Soudan (now Mali), again first the countryside, then the capital Bamako with its hill, Koulouba, above the vast plain of the Niger river. These African birth and childhood have left in me a great love for Africa, which the decades spent later on in France and in Auroville have not managed to dry up. Since my coming here I had been impatiently waiting for the creation of at least an embryo of African Pavilion, among those other Cultural Pavilions of various countries that were being born along the years in the area of Auroville that the Mother, its Founder, had designated for this purpose. At long last a few Africans had started to come (after two solitary ones) and finally, hardly a few years ago, an African Pavilion had been born… but at the time I was living on the main beach of Auroville, too far and too burdened with responsibilities to take part in this birth so eagerly longed for by me. 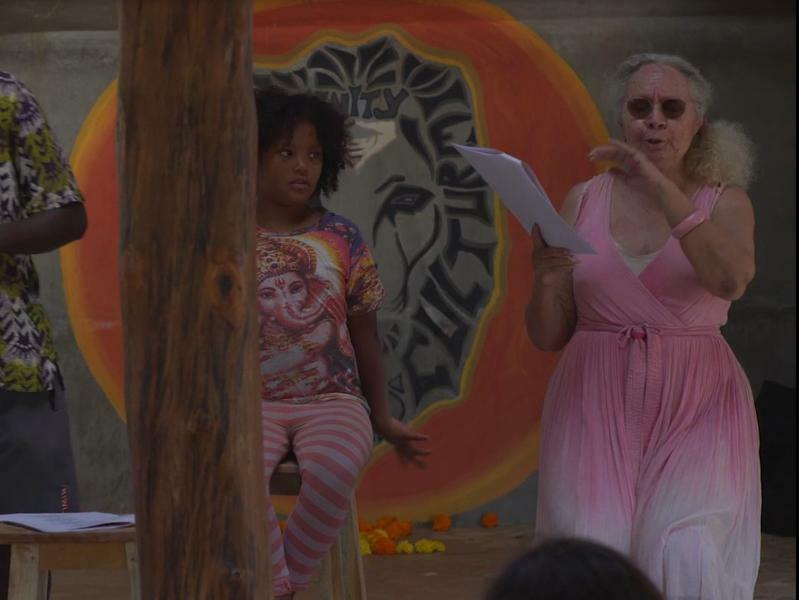 My fortunate return, end of 2014, to the Centre of Auroville, and now this Niagara of songs for Africa that was suddenly pouring down on me, gave me the perfect opportunity to finally get involved in the development of that Pavilion so cherished in advance. But, last minute surprise, what was intended to be just a small intimate celebration with the few musicians and the friends especially invited, later became , on the request of the Africans running the Pavilion, an official event to be publicly announced as the Event presented by the African Pavilion as its contribution to the Golden Jubilee of Auroville!!! Now, after this memorable performance, and also all the other events we all attended elsewhere before and after that one during that incredible Golden Jubilee Week, everybody is resting, exhausted… But, oh happiness, everything went fine, so we are savoring this well-earned rest, all the while smiling with gratitude to the Divine Grace that everywhere gave the invisible helping hand needed at the critical moments, and made everything finally possible… ad even a success! This personal Anniversary so special this year, at the African Pavilion, will remain engraved in my memory… and will mark also in its own way a grand Première in Auroville: the public beginning of a new aspect of the new Culture that is growing here: the AUROSPIRITUALS! Hi Bhaga – thanks, yes, in fact, we had a wonderful phone conversation the other day. We both studied with a teacher who is in the tradition of “Swami Ramananda” of Haridwar. he taught the use of a mantra for the descent of the Mahashakti – it was that path that led me to Sri Aurobindo. I may post some of his writings some day – they have a very deep “bhakti” flavor.